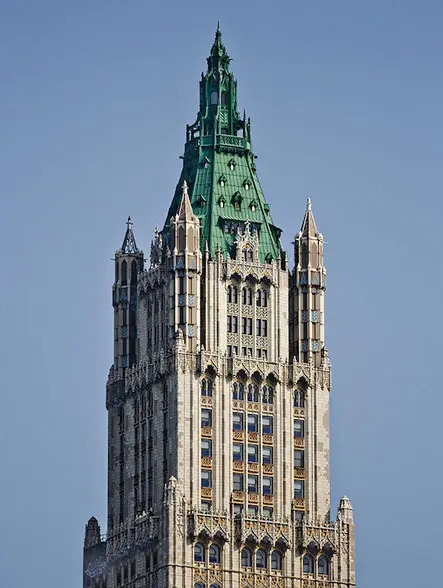 The Woolworth Tower Residences comprise 33 condominium apartments at the top of the 60-story Woolworth Building at 233 Broadway facing City Hall Park. The 792-foot-high building is one of the world’s most famous skyscrapers and was the tallest in the world when it was built in 1912. It held that title until it was surpassed in 1930 by the Chrysler Building, which lost the title 18 months later to the Empire State Building. Known as the “Cathedral of Commerce,” it was designed by Cass Gilbert, who also designed the sumptuous United States Custom House at the foot of Broadway. It abounds in Gothic-style tracery and Philip Johnson, the architect, told Carter B. Horsley, when he was at The New York Times, that it was his favorite skyscraper. The residential portion of the building has a 2 Park Place address. The building was designated a city landmark in 1982 and its stupendous lobby spaces were designated a city interior landmark the following year. One of the world’s most distinguished and historic skyscrapers, the apartments offer spectacular views in most directions although there are some taller buildings, including the World Trade Center and the Four Seasons Hotel to the west. Gilbert believed that the building’s “height should be recognized, insisted upon and expresses by vertical lines” and he opted for “the flamboyant Gothic tracery and ornament of the latter part of the 15th and 16th centuries, light, graceful, dedicated and flame-like.” He once remarked that the building had been called “The Cathedral of Commerce,” but maintained that “there was no intention of making it anything like a cathedral and in fact it bears no resemblance to a cathedral in the plan or exterior design or in any other respect. There are many medieval civic buildings to which it might be likened such as the Halls at Middleburg and Alkmaar in Holland, the City Hall in Brussels, the Hotel de Ville in Compiegne, the Cloth Hall at Ypres (destroyed in the great war) and many others all of which have towers of proportionately great height although of course very much smaller than the Woolworth tower….It was my thought …that I must express the idea of a civic or commercial building rather than of an ecclesiastical one….Woolworth’s first inclination was towards granite as the exterior material. Gilbert suggested limestone as a cheaper alternative. Eventually, however, terra cotta was chosen for all but the first four stories of the building where were clad in limestone…..Gilbert was interested in terra cotta because it was a think pliable material, with polychromatic possibilities, which, to his mind, could never be mistaken for a structural element. By wrapping the steel-age structure in an ornamental, polychromatic, thin terra-cotta skin, Gilbert felt he was justifying the building’s structure nature….”As finally completed, the building was lit ‘from the thirty-first to the sixtieth story. …The light has since been change. The building, which is between Park Place and Barclay Street has a 30-story base and a 30-story tower and the tower has two setbacks and culminate in a pyramidal roof and four tourelles that have been substantially altered from their original condition. The tower pyramid was originally gilded. The bank’s entrance was called the marble hall and was always intended to center on a staircase rising to the mezzanine level offices. Six angled piers are carried down into the base and four end in corbels carved as allegorical human faces apparently representing the four continents of Africa, America, Europe and Asia. The interior landmark designation report noted that “Gilbert’s elaborate decorative scheme was worked out in fine marbles , Gothic bronze tracery used even in the elevator doors and mail chutes, a colored glass ceiling in the Marble Hall, sculpted grotesques in both the Hall and the arcade, exquisite abstract floral mosaics reminiscent of early Christian designs in the ceiling, and painting triptychs in the mezzanine spaces over the north-south corridor of the arcade….the painted tryptychs in the galleries portray allegorical figures of Commerce and Labor; they were the work of Paul Jenewein. The glass ceiling in the marble hall is inscribed with the names of great commercial nations. The grotesque figures supporting the arcade galleries, by Tom Johnson, a popular caricaturist of the day, portray not only Woolworth paying for the building with nickels and dimes, Gilbert holding a model of the building, Lewis Pierson the head of the Irving bank, also Gunwal Aus, the steel engineer holding a beam, Louis Horowitz, the building, and even Edward Hogan, the renting agent. The building has a 24-hour doorman, a full-time concierge, personal mail delivery, an attended garage, bicycle storage, a swimming pool with sauna and hot tub, the Gilbert Lounge on the 29th floor, the Personal Fitness Studio on the 30th floor, and a wine cellar and tasting room. An article at ny.curbed.com August 21, 2014 by Hiten Samtani said that Alchemy Properties filed an offering plan for the condominiums with the New York State Attorney General’s office with a total sales price of about $443.7 million, including $110 million and the multi-story penthouse known as “The Pinnacle” that will contain more than 9,400-square feet of space and 499 square feet of outdoor space. Kitchens have custom Dada cabinetry crafted by the Molteni Group, Calacatta Caldia marble countertops and backsplashes, solid oak herringbone floors and Miele appliances. Master bathrooms have Calacatta Prima marble floors, walls and surrounds with Nero Marquina marble accent trim, radiant heat floors, steam showers, and Dornbracht platinum-finish fittings with Nanz hardward. The Pinnacle is a 7-level unit with three bedrooms. It has two bedrooms and three, angled, walk-in, corner closets with windows on the 50th floor, a large gallery leading to a 27-foot-wide dining room adjacent to a corner breakfast room with windows next to a 17-foot-long enclosed kitchen with an island and windows and an adjoining butler’s pantry and a bedroom and a corner laundry room with windows on the 51st floor, a great room with 1,350 square feet on the 53rd floor, and the 55th through the 58th floors will contain a library or media room and an observation deck. The average price per square foot in the offering plan was $4,172 a square foot, according to the article with prices beginning at $3.875million for a 1,290-square-foot unit on the 44th floor. Pavilion A on the 29th floor has 6,327 square feet with four bedrooms and 4.5 bathrooms and 1,227 of terraces. Pavilion B on the 30th floor has 5,127 square feet with 3 bedrooms and 835 square feet of terraces. Apartment 31A is a five-bedroom unit with a very large library/living/dining room and 6,056 square feet of space with four bedrooms and 638 square feet of two narrow terraces. Apartment A on the 32nd through the 39th floors and the 41st floor is a three-bedroom unit with 3,282 square feet with an entry foyer that leads to a 35-foot-long great room adjacent to a 16-foot-long kitchen. The master bedroom is 20 feet long and has a 13-foot-long walk-in closet. Apartment 43A is a three-bedroom unit with a very large and long living/library and wrap-around terraces. Apartment B on floors 32 through 39 and 41 is a two-bedroom unit with 2,548 square feet with an 18-foot-wide entry foyer that leads to a 25-foot-wide Great room adjacent to a pass-through, 13-foot-wide, windowed kitchen, A long galley leads from the foyer to the 18-foot-wide master bedroom that has a 9-foot-wide walk-in closet and a 13-foot-long master bath. Apartment B on floors 44 through 47 is a one-bedroom unit with a 17-foot-square living/dining room with a narrow, 27-foot-long, enclosed kitchen alcove. The building was designed as the corporate headquarters for the F. W. Woolworth Company, the “5- and 10-cent Store,” and the Irving National Bank. Gilbert joined the New York firm of McKim, Mead & White in 1880, but returned to St. Paul two years later to set up his own practice with James Knox Taylor, who was a fellow M.I.T. graduate. Mead urged Gilbert to become Daniel Burnham’s new partner after the death of John Welburn Root, but Gilbert chose to remain in St. Paul where he became president of the Minnesota Chapter of the American Institute of Architects. In 1895, he won the competition to design a new Minnesota state capital, which, according to the designation report, “laid the groundwork for his 1899 winning entry in the New York Customs House competition” and in 1900 he moved to New York. He would design the Broadway-Chambers Building in 1900 and the West Street Building in 1907, the Federal Courthouse in New York in 1934 and the Supreme Court Building in Washington in 1935.